THANK YOU Pinal County voters for approving propositions 416 & 417. As information becomes available, we will continue to update the website. Please click the image below for a larger, detailed image. 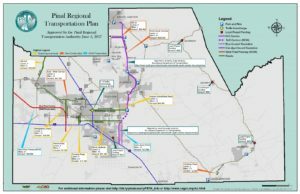 On Monday, August 6, 2018, the Pinal Regional Transportation Authority Board (PRTA) unanimously voted to appeal the Maricopa County Superior Court Tax Court’s decision on the Regional Transportation Authority. Yesterday, the Pinal County Board of Supervisors voted (4-1) to appeal the Court’s decision. lawsuit is untimely and without merit. The case is pending before Judge Chris Whitten in the Maricopa County Superior Court. Read the full press release. ANNOUNCEMENT: The Pinal Regional Transportation Authority is pleased to announce the formation of the RTA Citizens Transportation Advisory Committee (CTAC). Please click the CTAC Membership tab, located under the Boards & Committees header, to find your local representative. The first CTAC meeting will be held in April. Please continue to visit the Pinal RTA website for more information.